The Listening test consists of 4 sections. There are 40 questions in total. You need to answer all the questions as you listen to the recording. The recording is not paused at any time and you hear it only once. The questions get more difficult as you progress through the test. Are you scared yet? Don’t be! Listening is a skill, not a gift – read here what you can do to improve it. During the Listening test you will hear many distractions, and here is a technique how to deal with them. There are also clues to answers and you should be able to recognize them in the recording, read more about it here. And whatever you do, don’t leave anything for later as there is no later in the IELTS Listening test. Remember, it is important that you spell correctly all of your Listening answers, not just the words they spell for you on the recording. Also, make sure that your answers are readable and understandable, when you copy them to the Answer Sheet. You may write in pencil only. As you told don’t scared, but I have to man. Like, I am able to score between 23 to 27 out of 40. I am able to correct answer in choices like A,B,C or D. But the toughest part of listening is writting words in blanks. Is there any tricks to crack listening part. And also let me how many marks we need for reading and writting to get 7 bands. I heard that, 27 out of 40 means, 7 bands. Please advice me..
No one knows for sure how they calculate the band score (and if someone says he does ? it?s a lie), but we do have some hints. First, the official IELTS site has some tables and formulas, here is the link. Basically they say that 30 correct answers in Listening and Academic Reading give you Band Score 7, and in General Training Reading you need 34 correct answers to get Band Score 7. 1) If you get score from 6 to 6.24, they round it to 6. Now about more listening tips ? 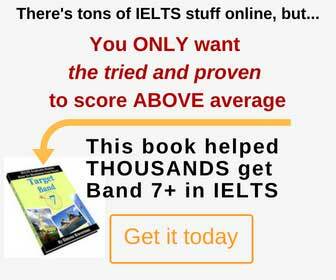 there are really great ones in “Ace The IELTS” e-Book .I don?t just recommend it because I sell this book (the profits from sales are used to improve IELTS-blog), but I really believe that it can help you a lot to improve your IELTS score. Those techniques have helped a lot of my students. The book has 66 pages filled with IELTS tips and it is impossible to squeeze all that in just one post. I will try though to add more Listening tips in my future posts, thanks for the feedback, man! The book is just GREAT ! Hi Azizul, sure, what kind of help do you need? Hi S, if you’re asking about Listening and Reading, capital letters don’t matter. You can write in all capitals as in ‘LIBRARY’, or in lowercase (‘library’), or just the first capital (‘Library’), it doesn’t affect the score.